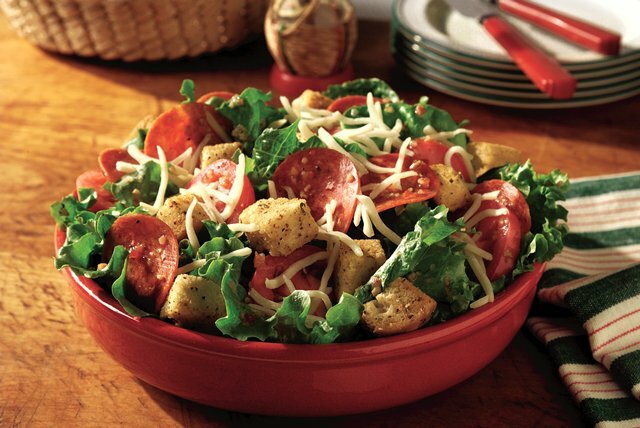 Greens tossed with croutons, tomatoes and Italian dressing are topped with pepperoni, mozzarella cheese and other pizza toppings for a fun salad. Toss greens with croutons and tomatoes in large bowl. Place suggested toppings in serving bowls. Pass to serve with the salad. You'll know it's a special occasion when you get to enjoy a serving of this salad. Serve this fun salad with grilled meat or poultry and hot cooked brown rice. Add sliced fresh mushrooms, pitted black olives, crushed red pepper and/or KRAFT Grated Parmesan Cheese to the salad before tossing with dressing.